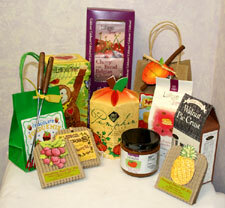 Looking for a housewarming gift, hostess gift, or just a special treat? We carry a great selection of unique, and novelty foods that are truly delicious (we know because we've tried them all!!!)! Come see our gourmet bread and dessert mixes, pie crust mixes, irresistible sauces and dessert toppings, health foods, Organic Items, Fondue kits, Children's baking kits, and tons more! Numi Teas are as beautiful to look at as they are to drink! 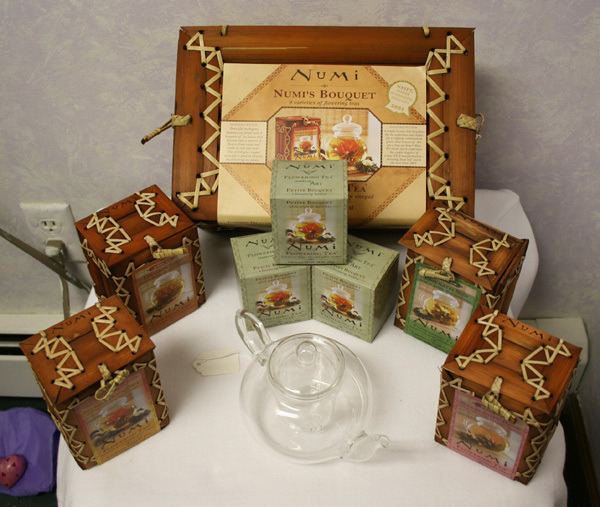 Numi uses all natural “Real” ingredients, no oils or flavorings. All teas and herbs are certified organic, and are Fair Trade Certified. Even the packaging has integrity, as it is comprised of 100% post-consumer waste. 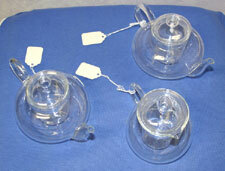 This alone saves 2,000 trees annually and reduces landfill by 131,000 pounds!! 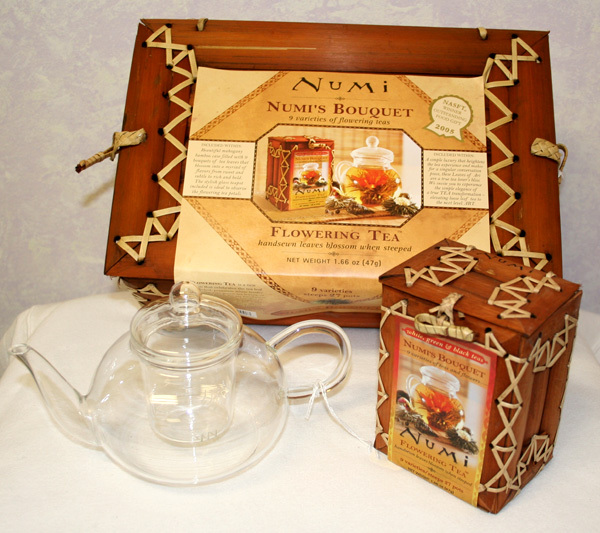 Gift boxes are made of bamboo with is chosen for its sustainability and abundance, not to mention its beauty! It is one of the most untapped and renewable of natural resources. 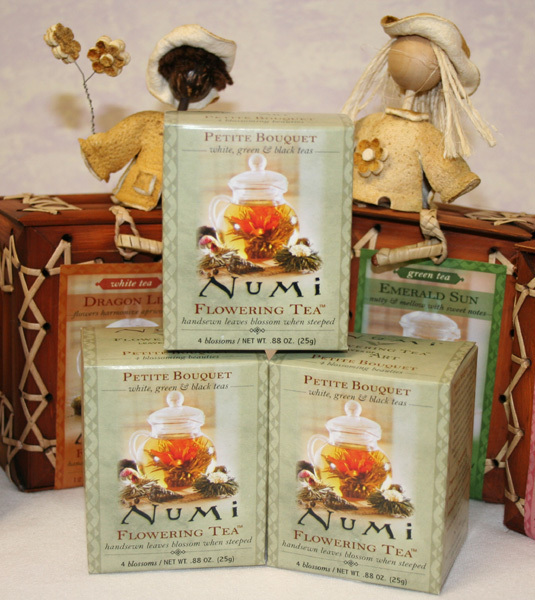 Numi provides employment for people with developmental disabilities, and are creating and implementing programs in China that will greatly improve the living and working conditions for the farmers!! 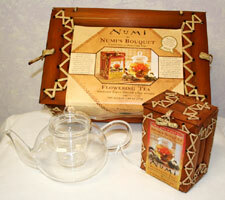 Flowering Tea is a new tradition that celebrates the tea leaf. 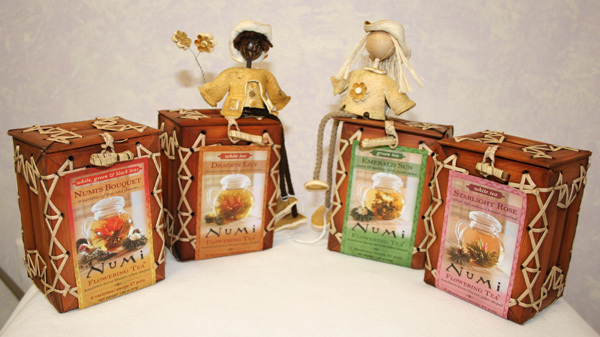 Hand picked, premium organic white, tender tea buds; top two green tea leaves; or golden-tipped black tea are hand sewn with cotton thread into bundles or rosettes by artisans throughout China. When steeped in hot water, these rare “Leaves of Art” slowly blossom into breathtaking shapes. Requiring no teabag or strainer, Flowering Teas are environmentally kind as well as easy to serve; just a glass teapot is needed. Choose from Assorted, Emerald Sun (green tea with a nutty flavor and sweet chrysanthemum), Starlight Rose (Silver tip white tea embracing a tender rosebud), Dragon Lily (Orange lily and sweet osmanthus flowers nestled in white tea leaves). Looking for a nutritious snack that is both Healthy and Delicious? 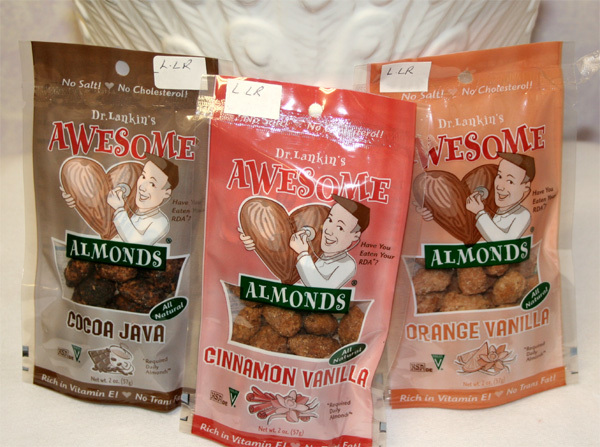 You can't go wrong with Dr. Lankin' Awesome Almonds. Each bag is filled with delicious vitamin E and Magnesium rich Almonds in your choice of Orange Vanilla, Cinnamon Vanilla, or Cocoa Java. There is no salt, no cholesterol in this all natural vegan formula. Minimum purchase of three bags. Bumble Bars are the ultimate tasty nutritious snack bar, full of vitamins, minerals, Fiber, and essential fatty acids! 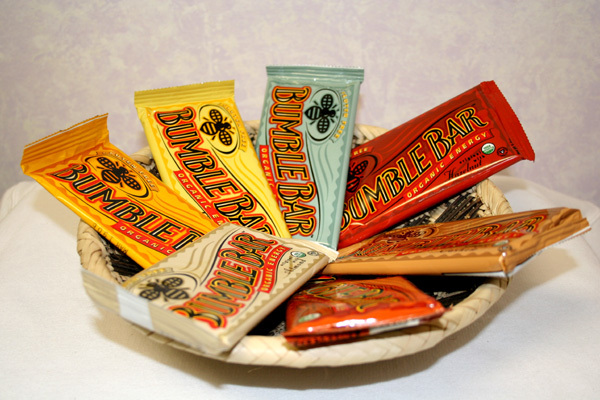 Bumble Bars are certified organic and are gluten-free, wheat-free, and dairy free! Organic seeds, nuts, soy, brown rice, and spices combine to supply a unique flavor to every tasty bite! Choose from eight delicious flavor; Original, Almond, Cashew, Mixed nuts, Lushus Lemon, Chai, Hazelnut, and Chocolate Crisp. Minimum Order of three bars.